Once Upon a Time… I was bumming over how there are no author events or signings even close to me for authors I would love to meet. I always wished to go to them but it is just not plausible for me distance and money wise. So I started googling to see if maybe, just maybe, I would get lucky and discover an author or two in the general area or surrounding cities at some point in the future. Then, what to my wondering eyes should appear? No, not a minature sleigh with eight tiny reindeer but an event called The Rochester Teen Book Festival! A book festival IN MY TOWN!!! I think I literally jumped out of my seat with glee! And I hadn’t missed it yet (That would have been my luck)! 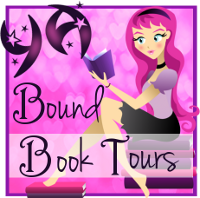 I immediately began to browse the website and was so excited to see that there were going to be a few authors I have read books from, and/or wanted to, on the list to attend! The event was from 9AM-5PM at a local campus, Nazareth College. Unfortunately i was not able to attend the entire program since it was my 5 year old’s last day of soccer, but I did get to go for most of it and arrived around 12:30PM. They had all sorts of games and things you could play and do raffles for. There was a HUGE table covered in bundles of old ARCs that were up for raffle. I was lucky to have 1 winning ticket and chose an ARC of Grave Mercy by Robin LaFevers and a t-shirt to go with it! I was very proud of myself for not going crazy and buying tons of tickets and continuing to play because it was a lot of fun! -She knew right away that Revived was going to be named as such, but Forgotten was originally going to be called Elsetime (or Else Time? Not sure if 1 or 2 words). She does suggest writing with a working title. Really she stresses more over character names than titles. She uses a baby name book, which I heard a few other authors say as well. Her character in Forgotten is named London Lane (LOVE IT!) because she loves all things British, including Alan Rickman! -Advice to writers: write and be proud of it, but walk away for a good month or so and then come back to it for editing and to look for holes. -When discussing the input she has on her covers she laughs and says there is a cover consultant clause but basically if you do not love the cover they tell you to learn to. -Her inspiration for All These Things I’ve Done came from walking around the city and seeing no funding for parks and also how fascinated she is about food and the recession. And a book was born! On to the next session! I really wanted to go listen to Barry Lyga (I Hunt Killers, Boy Toy) talk because I thought it would be fascinating to hear how he developed the idea of I Hunt Killers and any research he had to do but the room was small and packed since the previous session was going way over the allotted time. After 15 minutes I decided to try another one instead of waiting any longer. *sadface* BUT there was a Dystopian session with Megan Crewe (The Way We Fall) and Susan Beth Pfeffer (Life As We Knew It, Blood Wounds), and of course I am a HUGE Dystopian fan so I definitely had to check them out! Unfortunately I have not read any books by either author YET. I did however have a copy of The Way We Fall I brought to get signed, which I hope to read soon! Now I really didn’t know anything about Susan Beth Pfeffer’s books beforehand, but man does she make you want to read them! She was HILARIOUS! I could have listened to her talk for a lot longer than the session allowed. I didn’t take a whole lot of notes for this session but it was a whole lot of fun! -Blood Wounds inspiration was most likely from watching CNN and/or seeing Amber Alerts. -Uses baby name websites for character names. -Thought 95% of the books when she was growing up were CRAP! -Whenever she gets stuck while writing, she spends time daydreaming and watching the story play out in her head like a movie to get back into it. -A writer who was a huge inspiration for her was Roald Dahl, especially his book The Witches. -The character of Leo in The Way We Fall had 3-4 different names before Leo stuck. I really wish I wrote more down in this session but I honestly was too busy enjoying the things they were saying to stop and take notes. The very last session I was saving for Laurie Halse Anderson (Speak, Twisted, Wintergirls). She writes amazing books with powerful messages and I was crazy ecstatic she was at the event. I took a lot of notes for this one, so much in fact that she is the reason that there will be a PART 2 of this event recap! There is no way I could add it onto this one. BUT the best part… PART 2 will also have a giveaway!! That’s TWO SIGNED BOOKS I will be giving away from this event! So please come back on Thursday to hear all about Laurie Halse Anderson, my loooooong wait in line for the signings and a giveaway for a SIGNED COPY of SPEAK! Now on to the giveaway! 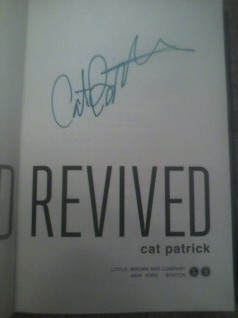 A SIGNED COPY of REVIVED by Cat Patrick! 5. Please follow the entry directions in the rafflecopter. 6. Anyone who follows only for the giveaway and unfollows immediately after may be disqualified from future contests. I don’t know how I feel about that kind of drug. I don’t really know how I feel about it. I have lost really close loved ones that I miss tremendously everyday that I would love to bring back. However with anything like that it is bound to blow in our faces. Great recap! This event sounded so fun and there were some really great authors who attended! That is interesting about the uncertainity of a title for Forgotten. Hmm a drug that could bring people back from the dead. I would kind of like it because who wouldn’t want to see someone who they have love and lost again but also it’s kind of scary and could be used the wrong way. So excited about your first giveaway! A drug to bring people back to life… indefinitely, or just for a quick hello? Because if there was some drug that could bring people back from the dead forever, I think the world would become so over populated it would be crazy chaos. But if it was for a quick hello, to take care of unfinished business, well that might be ok. Thanks for the giveaway…your first!!! This book looks extremely interesting and I can already foresee me having some mixed views on this drug. 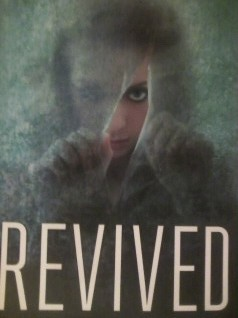 Still, Im excited to read this book! So different. I’m all for that kind of drug! If I’m dying please inject!!! I’m with Kimberly. In fact that’s exactly what I was thinking. Took the words right out of my mouth….Sounds scary indeed! Thanks for the giveaway. I can’t wait to check this book out. But I am glad that the revival drug keeps bringing Daisy back! She is such a sweet character! Thanks for the giveaway! It’s good and it’s bad. For good, it can give people who didn’t deserve to die a second chance at life. For bad, it’s just plain creepy. And it can be abused. I would not use it. When it is my time to go, then I will. The idea is definitely alluring…I think it would come down to the circumstances. I think it would be kind of cool but i wouldn’t want to mess with it. Hmm it depends on who we bring back? I think it sounds like a good idea, but I don’t know how it would work for sure. Thanks for the giveaway! This giveaway sounds great! Thanks! Hrm…a drug to bring someone back to life. It really depends, if the person would stay alive as in like immortal I don’t think that would be too good and I wouldn’t want to see my loved ones go through life having to see everyone else die…on the other hand if it’s something temporary then yep I’m all for it to see my mom & grandparents again! howdy! 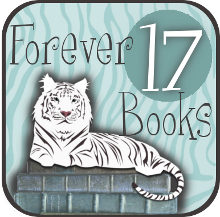 , Everyone loves ones publishing very a great deal! percentage many of us communicate more regarding your report in Google? I actually call for a specialist with this living space to fix this dilemma Proxy Harvester. It’s possible that is an individual! Getting excited about fellow you.